The importance of research in this project cannot be stressed enough. From the moment Michael began adapting and expanding Barbara's poem into a musical, every effort was made to avoid cliche. 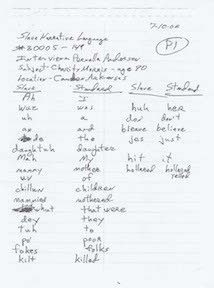 Michael started his work by writing a list of every cliche item, character, and trope that would be expected in a dramatic work set in the slave culture and system of the Southeastern Untited States. Michael stated that none of these items would be in the musical. Michael said to Barbara, "The audience already knows these things. They expect to see them. Let's give them something they don't expect but is also true. Research was intence for a three-year period. Occasionally during the subsequent years through the table reading and workshop performance process, additional readings had to be done. Not all the research came from the Slave Narratives. The work had other influences as well. 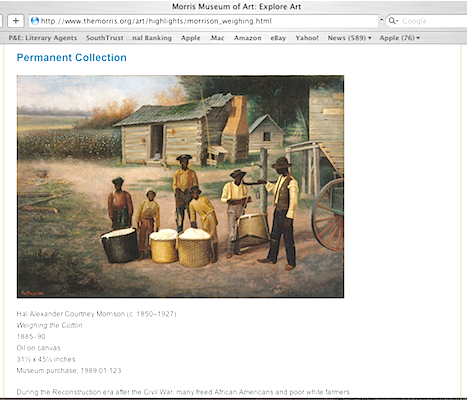 Additionally, works of art made during the time period help visualize items described in the Slave Narratives. Some research was tactile. Michael visited a cotton field and brought home a some cotton. He kept it on his writing table for many years. In the process of reading hundreds of Slave Narratives, Michael could see how the language of the slaves varried from plantation to plantation and across the Southeast. 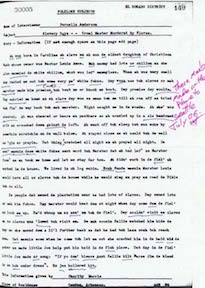 He made and item analysis of select Narratives, Barbara added to this her life-long experience. Together, they created characters each with their own distinct voices. "Research is the opposite of cliche." 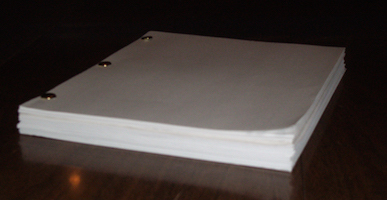 Michael's Research Book, a compilation of the research used in the creation of the work and a copy of Barbara's original poem. 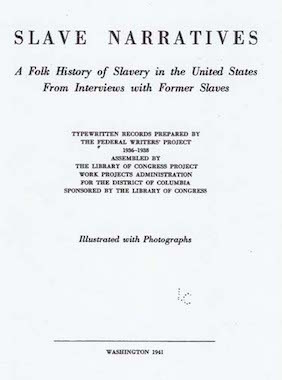 For each page of Slave Narrative in the Reseach Book, Michael read from 15-20 other Narrative pages that provided rich information but were not specifically drawn from. Although not painted during slave times, it was painted very close to the Civil War. Considering the slow rate of the spread of the industrial process across the south, this painting's depitions could be considered accurate to the time of the musical. In addition to the house, dress, and proximity to the cotton fields, is the scale on the post. Michael came across mentions of cotton scales while reading the Slave Narratives. It was on a random trip to the Morris Museum of Art where he saw this image of the scale that had eluded him. The Slave Narratives were also used to create distinct vocabularies and usage for the different charaters. Michael made detailed item analysis from a variety of Narratives and those were combined with Barbara's lifetime expereinces. 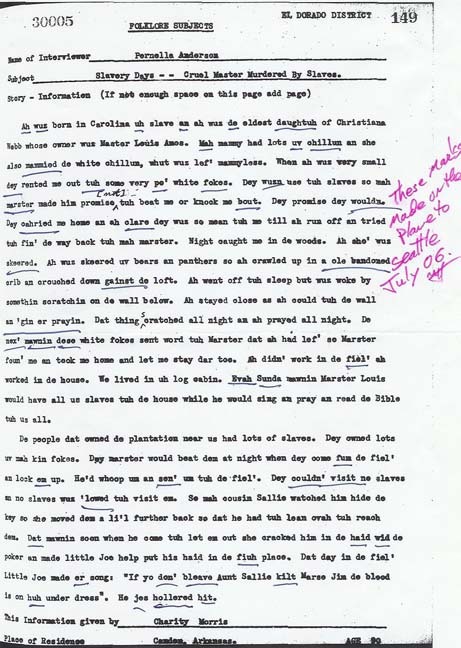 This gives each character a unique use of southern slave vernacular. This purposeful design permits the work to maintain the attributes of a verbal "time capsule".